U.S. Lawmakers from both sides of the aisle are competing face time with Syrian President Bashar al-Assad. 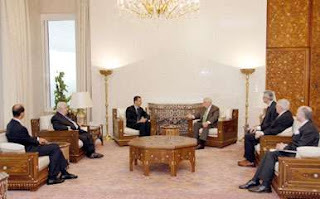 On April 1, House Republicans Frank Wolf of Virginia, Joe Pitts of Pennsylvania and Robert Aderholt of Alabama met Assad to discuss “Iraq and Middle East issues in general.” The same day, House Speaker Nancy Pelosi annouced that she would traveling to Damascus on April 3 with a delegation of Democratic lawmakers, including Tom Lantos, one of the chief backers of the Syrian Accountability and Lebanese Sovereignty Restoration Act of 2003. Reports indicate Pelosi will convey a message from the Israeli leadership that a precondition for peace talks will be Damascus rejecting its support for Palestinian groups based in Syria. There are many rumors in Washington that the International Crisis Group (ICG) is playing a behind the scenes role in bringing Syrian and Israeli parties together. A few months ago, ICG placed analyst Peter Harling in Damascus, following extensive work from Iraq.